Well, You guys are great. The best is the variable opinions present. No single correct answer, but many good answers. Guess I need to try me some skis over Xmas at Boyne Highlands. Fischer sounds like first choice. I really appreciate all the input. Hey BT -- you are absolutely right. Only you can decide what is the right ski for you. I hope we've put some other options into the mix and given you food for thought that will make your final choice the best fit for you and how you want to ski. Best of luck with the hunt, and have fun demoing this winter. BTW, we live in Ontario, near Toronto, so not far from you. If you're having trouble finding a certain ski to demo, let me know and I can point you to some shops in this area that may have what you're looking for. Turn it into a fun road trip and demo a few great skis. First, how did you find the Real Skiers forum? We would like to grow so it of interest when a new member signs up ....and feel free to keep posting. Second, how did you i.d. the Rossi 70 as a potential ski? I'm always curious about why a specific ski surfaces, maybe someone in a ski shop recommended it or a friend, or you like the Rossi name or, heck, you just like the graphics. I am glad that you did match a ski with your style prior to asking. By the way, if you come across a smokin' deal on any of the above skis do it, they all ski pretty much the same. Googles ski website and posted. Nothing more. Other websites are much less tolerant of questions like this, and I just tried with this site. I really like the ability to get information without too much judgement. Then you can not make a mistake, hopefully, with an investment. 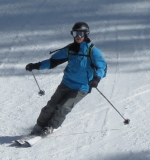 Strato 70---Last Jan and Feb I demoed skis...Volkl AC 30, K2 multiple models, Rossi Avenger 82 and 76. Well if you are a strong skier, I am not surprised the Strato 70 felt better than all those skis. It has close to race room construction, full laminate build. It also comes with a much better binding. Like it's been said, if the price is right and a slalom carver is what you are looking for, it would be hard to beat the Strato 70ti in a 165cm. Are you an insomniac...you're posting @ 4:48am??? Gee Liam, 5:02 AM is not much better . So who is the insomniac, the poster or the reader at that time of the morning?? I wonder if everyone has modified their profile to reflect their timezone offset relative to the server location. The system tries to convert everything to and from your local time, but if the poster doesn't have it set or the reader doesn't then it will be off. Go to Profile -> Modify Profile -> Look and Layout. For me on the East coast, the offset value is 2. There is an auto-detect link and it also displays the server time so that you can compare to your local time. I have the same offset in time (that'd be 7:02 for the previous post...but I was just poking fun at the 4:48am 'cause it looked funny). Hmm. My post was at 9:23 and that is what shows on my display. Will be embarrassing if my setup is wrong.